Jochen's latest creation can be summed up in one word - stunning. When you see his new Benzinger Regulator in person, you'll just stare. The design, fit, finish and decoration are without peer. And his use of circling rings to show off the dial is off the charts. It's easy to forget when viewing a watch like this the little things. For example, take a minute to enlarge the photograph above showing the front of the watch, and you'll notice a dial plate with a sunray style of guilloche. Jochen creates this dial by hand using an engine turned rose engine (an antique machine no longer in production). Each cut is individual, back and forth and one slip can ruin the dial. Next, take a look at the back, and you'll see skeletonization like no other. The gold colors are rich, the patterns elaborate and the movement really takes on the level of art not unlike a famous painting. 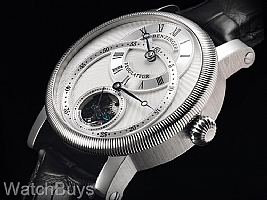 To own a Jochen Benzinger watch is not only an honor, it's a rarity as his production is so low. 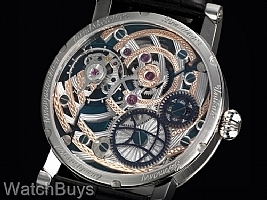 This watch is manually winding with a power reserve of 46 hours, and features a sub seconds hand at 6. Sapphire crystals on both sides. The presentation box is elaborate, and naturally features engraved plates describing and naming the watch.